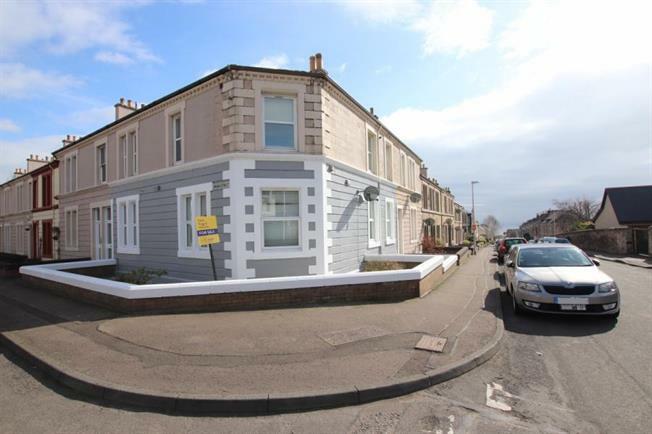 2 Bedroom Ground Floor Flat For Sale in Kirkcaldy for Offers Over £93,000. Slater Hogg and Howison are proud to offer to the market this impressive ground floor flat which is situated within a popular central location. The spacious accommodation is set on one level and comprises entrance hallway, lounge/dining room, kitchen, two double bedrooms, study/box room and bathroom. The lounge/dining room is a bright and spacious reception room with front and side aspect windows. There is space for a family size dining table and chairs. The kitchen is fitted with a modern range of high gloss base and wall mounted storage units with a range of integrated appliances. There are two beautifully presented double bedrooms each with storage. The box room may be used for a variety of purposes including a study or dressing room ( the current owner has the room set up as a bedroom). The modernised bathroom has been fitted with a three piece suite in white comprising w/c, pedestal wash hand basin and feature bath with overhead mixer tap shower. Warmth is provided by a gas fired central heating system and double glazing is installed. The property also benefits from storage, garden and communal drying lawn. The property is move in condition and would suit a variety of purchasers and Slater Hogg and Howison would encourage early viewing. Please refer to the Home Report for EER Banding.